In 2017 alone, Americans consumed 3.82 trillion kilowatt hours of electricity. EIA says that residential consumers accounted for 37.4% of this. That makes us average folks the biggest energy users! That’s not all though. In the same year, the U.S. went through 7.26 billion barrels of petrol. That averages to about 19.88 million barrels a day. But… Why should you care? For the simple reason, your furnace plays a huge role in energy consumption. If you haven’t had furnace maintenance in a long time, you may already have an inefficient heater. That’s a major energy-waster, which means you’re paying more than necessary to heat your home. What’s more, it may no longer warm you up enough to make the cold winter days more tolerable. That thought should be enough to send shivers down your spine (sorry for the pun). So, don’t compromise comfort! Follow these furnace upkeep tips before winter rolls in! Before doing any maintenance work on your house furnace, make sure you turn the power source off. Even if the job is as simple as a filter replacement. The last thing you want is to sustain burns, get an electrical shock, or worse, start a fire. Filters protect the interior parts from all the gunk (think dust and debris) the heater pulls in. It also helps boost indoor air quality, since it prevents recirculation of contaminants. That second part is a big bonus, considering that indoor air can be five times as polluted as what’s outside. As you can imagine, all those months of previous furnace use can clog up the filter with dirt. Aside from restricting air flow, dirty filters can make your home a health hazard. Clean filters are as important to furnace efficiency as to your health. So, before you start relying on your furnace this winter, get that filthy filter swapped with a new one. During the peak season, consider replacing it every month. Make sure you still check your instruction’s manual for manufacturer’s recommendations. If your system uses a re-washable filter, take it out and give it a thorough cleaning. Like with replaceable filters, wash it at least once a month during the high-use season. 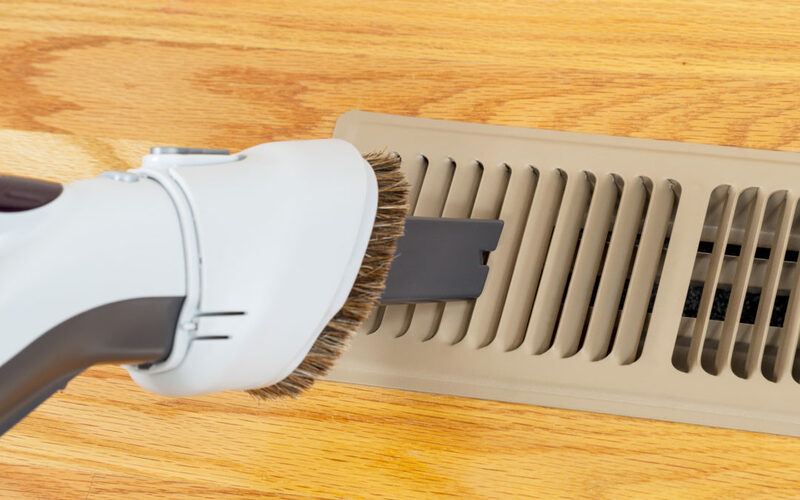 Most of the furnace cleaning tips in this list involve a vacuum, so consider investing in one if you don’t have it yet. Besides, it’ll also serve you well when it’s time to clean your AC’s outdoor unit. Going back to cleaning your furnace, start with a visual inspection of the blower blades. As the name suggests, they’re the part of your furnace that circulates hot air throughout the house. If they’re full of dirt, it follows that the circulated air is full of contaminants too. With a screwdriver, get the screws out and take the entire blower from the unit. Time for some vacuuming action! You can also use a small brush to dislodge dirt build-up, then use the vacuum to suction it out. Next, check the blower belt for any wear, tear, fraying, or cracks. If you see any of these signs of damage, have it replaced. They’re cheap, for only about $5, and replacing them is a cinch. Thanks to your furnace burner’s flame, you enjoy heated air during the winter. It’s the system’s main source of heat, after all. It ignites the gas that flows through and pushes the heat up into the exchanger. If there’s something wrong with the burner, such as leaks or dirt build-up, it’ll affect efficiency and safety. That’s why a burner flame check is integral to regular furnace upkeep. The color of the flames will tell you whether it’s in good condition or not. To check this, put the power back on and get the thermostat going. Now, look at the color of the flames. If it’s blue and the flame is even, you’re all good. If you see yellow flames, power off your furnace right away. Although that’s a common sign of filthy burners, it can also mean the heater produces carbon monoxide. It’s a deadly gas that you don’t want circulating in your home. Keep in mind that CO poisoning leads to about 20,000 to 30,000 people suffering from illnesses every year. Worse, it claims an estimated 500 lives each year. You may want to clean your burners first (we’ll explain below). But if it still gives off yellow flames, it’s best to have a qualified technician check it out. A professional furnace service can ensure you’re not breathing in dangerous gases. Even if your burners give off a blue flame, if it’s uneven, it’s best to give it a thorough vacuuming. Again, before doing anything, turn the power supply off. A 1/2-inch drain line extending to about 20 inches in length will let you reach the area behind the burners. Attach this to your vacuum and clean the back area first. Make your way to the front, and be sure to vacuum the base of the furnace and the blower compartment too. The flame sensor tells the furnace if there is an actual flame or if it’s only the gas valve that’s open. It’s quite easy to tell which one is the sensor-it looks like a thin, bent metal rod. You’ll find this located in the area in front of where the furnace produces flames. A dirty sensor can contribute to false readings that you have an unlit pilot (more on this below). So, keep it clean by giving it a gentle wipe. A clean, lint-free cloth is enough, but a microfiber towel will do an even better job. If the pilot light doesn’t come on, your furnace won’t turn on. If it’s dirty, the hot surface ignitor won’t have anything to ignite your furnace with. As such, make sure you keep both of them clean to prevent issues with your heater’s on and off cycle. In most cases, blowing on a drinking straw will remove dust and dirt on these devices. Make sure you don’t touch the ignitor as this part is quite sensitive. Follow these furnace maintenance tips, and you’ll get through the cold winter days. But if you’re not comfortable with the thought of DIY upkeep, HVAC technicians can help. Want more heating and cooling tips to ensure all-year comfort at home? Then please feel free to visit our blog!